A peculiarity of the Haast rivers is that they are absolutely choker-full of logs. The apocalyptic floods which come down from the Alps and periodically turn the rivers into something akin to horizontal waterfalls, bring down enormous amounts of timber debris. Logs piled up like pick-up sticks over deep pools and outside bends make an ideal habitat for large trout. And a hell for an angler trying to catch them. It was my turn to cast when we came across this particular fish and, ever the optimist, I still had on a silicon smelt imitation tied to a length of solid tippet. 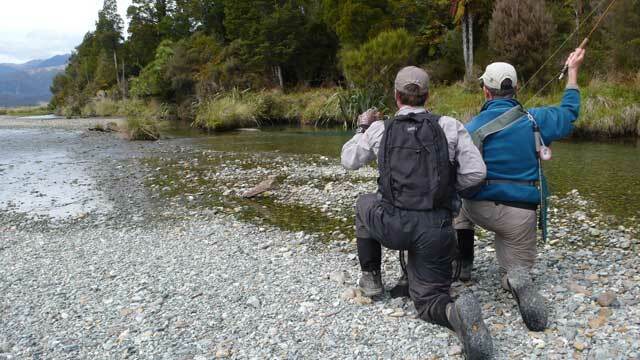 As I put the fly down, it bounced off the surface slightly and the fish burst out and took it in the air. This, I knew, was the easy part. I looked around and saw trees everywhere. And I thought “here we go again, it’s like lassoing a wild horse in a forest.” The odds of not getting tangled were minimal. Oh, I knew all too well what happened when he did, when every square millimetre of his concertina-like fins found purchase against the water and its currents, when all his muscles, his entire being, were turbo-charged by the do-or-die boost of adrenalin. One summer, in the course of a day on a nearby river, so barricaded with fallen trees you’d think someone had introduced beavers here, and they nested and broke out into a plague, I hooked five fish all around the eight pound mark. The cicada takes were electrifying. The fish would often ram the fly first, stunning the artificial insect, then back off to watch for a reaction. At this point, with my whole world coming to a standstill of anticipation, I’d give the fly a slight twitch, as if the bumbling insect was about to get away, and the fish would strike again, this time with its mouth open. So far so easy. 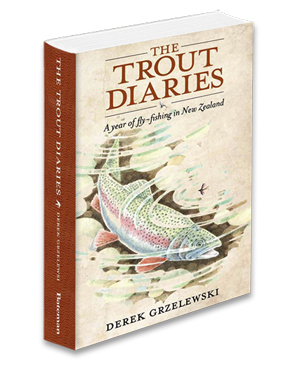 The flies, brown deer-hair cicadas, were half the size of my thumb and barbless, and the tippet, with nothing fancy required, was the 8lbs Maxima, as solid and dependable as trout tippets get. So what could possibly go wrong? Only one thing: the initial run seemed unstoppable and at the end of that each of those fish invariably found a tree to go under. The clever ones swam through entire root systems and weaved a couple of deft figure-of-eights around the tangle. The flyline would start to vibrate like a badly out-of-tune guitar string played by the current, and by this time, of course, the fish was long gone, having left me firmly fastened to a log jam. Only with one of those fish I had a glimmer of hope. As it took the fly I looked down and saw we had more than a 300 metre stretch of clear gravel, with not a snag in sight. “You’re mine,” I thought. Alas no. Once the fish put its muscles to it, in no time we covered those 300 metres, below which there was a mother of all log jams. Each fish was a variation of the same scenario, so was the following day and the day after. Hooking those large fish – and by God there were plenty of them – was a child’s play but in three day’s fishing I did not land a single one. Now Craig, who is a consummate backcountry adventurer, offered a practical solution to this quandary, not just theorising how it should be done but demonstrating it in action. You had to rodeo the fish, muscle it quickly the way a cowboy brings down and ropes a cattlebeast. Speed was of paramount importance if you were to take advantage of the trout’s shock and confusion at being hooked. In a nutshell, you could not give these fish even an inch of slack. From the moment of hook-up you had to keep the fish flapping on the surface no matter what, while your gillie mate jumped into the water and netted the brute. This was easier said than done because the fish pulled so hard the rod tip was almost touching your reel hand. It was hard because it was counter-intuitive. By nature and from experience, you’d want to let the fish run, to tire it out, reel in just enough to keep a tight line and no more. But here you could not. These fish did not cut any slack. The rodeo approach meant that the entire combat was over in a flash which required a coordinated teamwork, and above all decisiveness and commitment on behalf of the netter. After a couple of bungled attempts we got the idea and the timing, and good that we did because it was obvious no other strategy would work here. Some of the fish we caught were literally living in deep-pool windows framed on all sides by logs and sunken trees. Even a moment’s hesitation, the tiniest bit of slack, was enough to let them find cover and snag the line. The following days, benefiting from Craig’s local knowledge, we explored a couple of little-known spring creeks and found plenty of fish. Almost without exception they favoured their log homes and without using the rodeo principle I doubt we would have landed any of them. Walking back at the end of the day I thought how the fish here were as hardy and resilient creatures as any of the Coasters, and how anglers had to match and adapt to their ways. And I mused how, in an oblique sort of way the West Coast government prospectus was right. 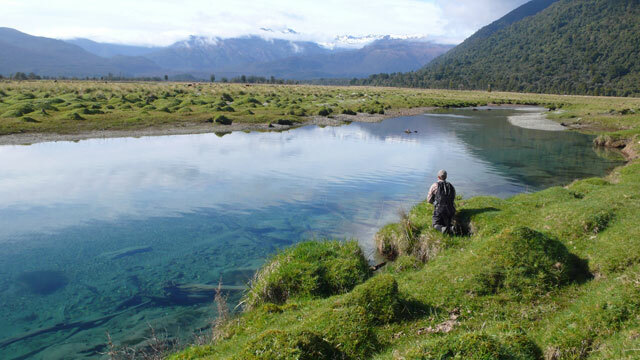 The Haast region was indeed a promised land, but only if you loved the high challenge of fly fishing for large and crafty trout.